Consumer Reports announced last month it will give extra credit to models with autobraking, and Thatcham recently applauded support from CR counterpart “What Car?” in demanding the tech be standard in the United Kingdom. The push for the technology from two leading auto consumer magazines echoes the 2015 U.S. federal and OEM push to make autobraking standard, matches consumer’s views and will lead to lower insurance premiums, according to Thatcham, the U.K. version of the Insurance Institute for Highway Safety. A January Insurance Institute for Highway Safety study estimated that auto-braking paired with crash warnings can cut 39 percent of all rear-end crashes, which works out to about 13 percent of all the crashes in America. In May 2015, the European and Australian versions of the NHTSA reported nearly identical results: Low-speed auto-braking cut rear-ending by 38 percent. That alone would be a problem for collision repairers, and the technology is in its relative infancy. CCC in January reported it hasn’t seen real-world crash reductions from such safety technology — but it thinks they could be coming soon. The IP elaborated on this in its 2016 Crash Course released Tuesday. A December-January study by Thatcham and Direct Line Insurance found that 82 percent of drivers want the technology standard and free, according to Thatcham. Potentially further spurring consumers to demand the technology, insurance rates should fall about 10 percent with autobraking, the organization said. 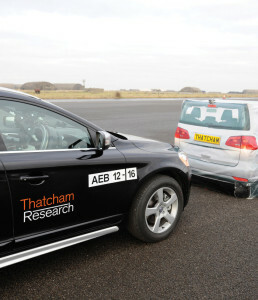 “There is no longer any excuse for car makers to launch new cars without AEB as standard across the board, and along with dealerships, to promote and explain AEB more effectively to consumers,” Thatcham research director Matthew Avery said in a statement. Thatcham has called for standard autobraking dating at least as far back as 2014, according to What Car? coverage. Last month, Consumer Reports announced it adjusted its ratings to give bonus points to OEMs which made some combination of forward collision warning and low- or high-speed autobraking standard. Forward collision warning tells the driver when they’re about to hit something; autobraking actually stops the car. “Consumer Reports sees FCW and AEB as the most promising safety breakthroughs in the automobile industry since the advent of electronic stability control almost two decades ago,” Michelle Naranjo wrote in a Feb. 23 post. “We are urging automakers to make those features standard on all cars, from luxury to economy models, as quickly as possible. The IIHS has also called for autobraking to be standard and pursued a similar but less severe strategy than Consumer Reports. Vehicles can’t get Top Safety Pick+ unless the model offers autobraking as an option.